This site has been moved as of October 2012. To see Washington Square Park Blog posts now, visit WashingtonSquareParkBlog.com. Thanks for your interest! New Posts return Tuesday, January 3rd — Happy New Year! Got a bit backlogged but a slew of new posts coming. Stay tuned. New post tomorrow (Thursday)! The following piece, “Why is it so Easy to Fall in Love in New York?,” explores public spaces and how we relate and interact with others within them. Featured at WNET Thirteen.org’s Metro Focus column July 11th, it is adapted from Ariel Sabar’s recently released book “Heart of the City: Nine Stories of Love and Serendipity on the Streets of New York.” Sabar’s parents met in Washington Square Park. My mother and father met in Washington Square Park in the mid-1960s, and I’d thought I knew the story well. But not long ago, my father shared a detail I had not heard before. He said he’d actually spotted my mother on the streets outside, but didn’t have the nerve to approach until she’d entered the park. The streets were too exposed, my father said. Attractive as she was, it would have felt improper to strike up a conversation there. The park, though, was different. It was like stepping into a village. The park shrank the city, he told me. It slowed time. With its roving paths, its fountain and trees, it filtered away the facelessness and noise of the street. Once inside, he said, people ceased being strangers. For a fleeting moment, they were on common ground. They were sharing something: not just the leaves and grass and water, but the human carnival. And that got me wondering: Were some public places more likely to induce friendly glances than others? Could some actually encourage people to take the first steps toward falling in love? In doing some research on those questions, I found myself knee-deep in the little-known field of environmental psychology. Environmental psychology came of age with the social movements of the late 1960s, when architects and psychologists began discussing how the design of everything from rooms and buildings to streets and cities might contribute to social ills like poverty, crime, mental illness, overcrowding and isolation. Underlying the research was a universal question: how do the physical places where we live, work and play shape us? Another question is … how do we shape them? Dr. Philip Landrigan is a respected pediatrician and expert on children’s health at Mt. Sinai School of Medicine in NYC. He has written a letter (7/21/08) urging a moratorium and raising alarming concerns on artificial turf to the Connecticut Department of Environmental Protection. No word on whether this same letter has been sent to the NYC Department of Health or NYC Parks Commissioner Adrian Benepe (who seems to have a difficult time reversing course no matter how stunning the evidence). NYC, under Commissioner Benepe’s direction, has installed 94 artificial turf fields thus far in parks and ball fields. Despite concerns, plans move forward to install 68 additional turf fields across New York City. Synthetic turf fields have proliferated in recent years, and there are now more than several hundred of these installations in Connecticut and in other states up and down the East Coast. Almost no assessment of the potential hazards to children’s health of synthetic turf fields was undertaken before these fields were constructed. The stated need for their installation was a desire to improve the quality and enhance the drainage of playing fields coupled with a strong impetus to get more kids out and exercising as a way to combat the obesity epidemic. These are laudable goals. The problem is that they were pursued without any consideration of alternatives or analysis of potential negative consequences. There was insufficient due diligence. The result now is that we are in a situation in which a number of these very expensive fields have been installed, and we are suddenly and belatedly beginning to realize that they may lead to health problems. 2. Immediate study of the suspected chemical hazards of synthetic turf fields. A quick blog entry today. Note: There are 262 posts in the archives so scout around a little. Here are some great tips from Reverend Billy on how to commemorate Buy Nothing Day (tomorrow, day after Thanksgiving, biggest shopping day of the year) this week. Also, join him at Union Square tomorrow Friday, November 28th from 3-5:30 p.m. More info at the link above. Enjoy your day. 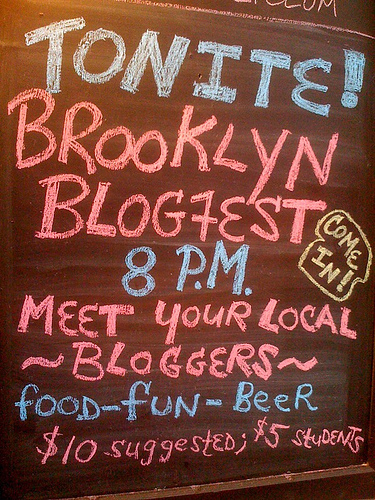 Only the city’s bloggers like Your Free Press, Pardon Me For Asking, The Brooklyn Optimist, The Daily Gotham, Queens Crap, and Washington Square Park [note: yes, yours truly] reported to their readers during the term limits debate that the Council’s argument for continuity of leadership to save the city’s economy was nothing more than public relations spin to cover the Council’s blatant power grab for an additional term in office. At the same time these citizen journalists across the City were reporting the real facts, the Mayor was meeting with the publishers of the three major dailies to coordinate a cover story for his support of extending term limits. Siegel’s lawsuit argues that … in favoring corporate-employed reporters over citizen journalists and independent bloggers, the City’s press credentialing system effectively chooses to license primarily staid, cautious reporting – with a strong bent toward corporate coddling – over the dynamic, unadulterated articles of journalists like [plaintiff Rafael] Martinez-Alequin. The city’s fast-emerging community of bloggers is quickly growing its readership simply by providing the type of truthful analysis that is hard to find in the City’s dailies. In so doing, New York’s blogosphere has established itself as the City’s premiere forum to debate controversial opinions, encourage participation in local politics, and further the belief that people should control their own lives. I’ve thought often about the role of New York City’s bloggers in reporting the dramatic changes in our city under Mayor Bloomberg which go largely unreported by the mainstream media. Without this information, one day we’d all wake up, would not recognize anything about where we are and we’d wonder how it happened. And so much for going against any of the Mayor’s redevelopment or rezoning plans as Hunters Point South and Willets Point plans were approved by the Council yesterday despite the fact that, at Willets Point, much of the land will need to be taken by eminent domain. There are thriving businesses there. It’s just they are mostly auto shops and a bit bedraggled, and not considered particularly valuable (the business owners and people who frequent them would disagree). Instead of fixing up the area over the years (sound familiar? ), the city got into a contentious fight with the owners who don’t want to leave. The Times story does not quote anyone opposed to the City Council vote.